..... a city located in the western portion of Tokyo Metropolis, Japan. As of 1 February 2016, the city had an estimated population of 150,984, and a population density of 8810 persons per km². Its total area is 17.14 square kilometres (6.62 sq mi). Higashimurayama is approximately in the north-center of Tokyo Metropolis, on the Musashino Terrace. The area of present-day Higashimurayama has been inhabited since Japanese Paleolithic times, and numerous remains from the Jōmon, Yayoi and Kofun periods have been discovered. During the Nara period, it became part of ancient Musashi Province. During the Kamakura period, it was the location of the Battle of Kumegawa in 1333. 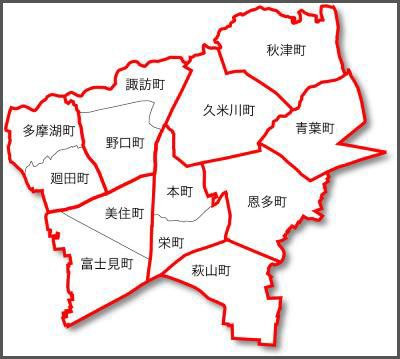 In the post-Meiji Restoration reform of April 1, 1889, several villages merged to form Higashimurayama Village in Nishitama District, at that time part of Kanagawa Prefecture. 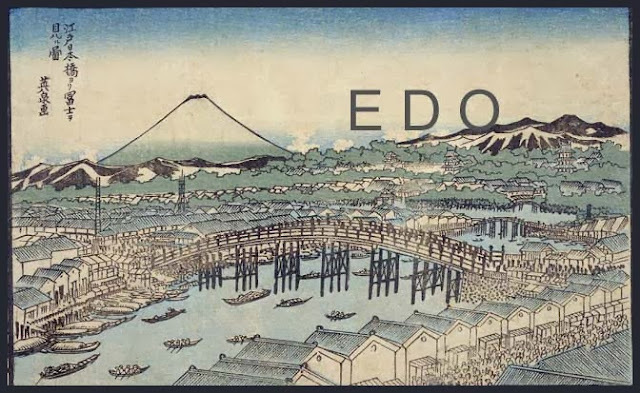 The entire district was transferred to the control of Tokyo Prefecture on April 1, 1893. On April 1, 1942, Higashimurayama Village became the town of Higashimurayama. 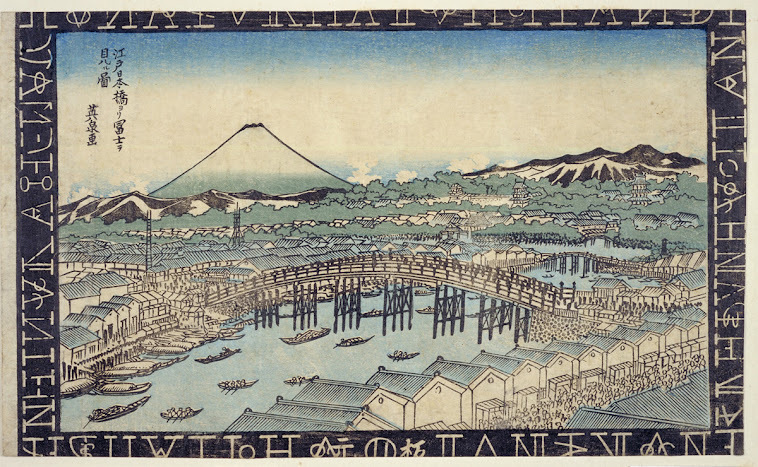 On April 1, 1964, Higashimurayama was elevated to city status.
. Musashi no Kuni 武蔵国 Musashi Province / Bushuu 武州 Bushu . As you can see on the map above, Kumegawa village is just in the middle of Higashimurayama city. The Kumebe were one of the five military clans : the Otomo, Kume (Kumebe), Imibe, Mononobe, and Nakatomi. 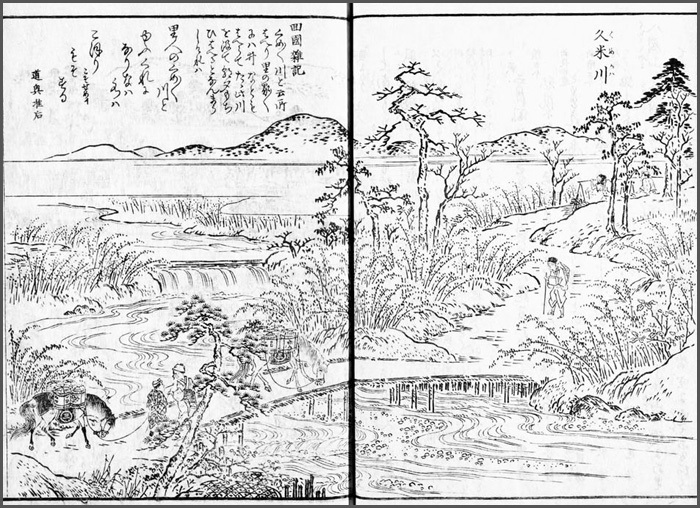 The Kuma clan held the land on both sides of the 川 river, soon named after them. Kamakura Kaidō, Kamakura Highway or Highways during the Kamakura Period. There was a huge zelkova tree along the highway. They say it used to cry to let his owner know that it did not want to be cut down. Baigan-ji Temple is an ancient temple of Sotoshu sect, said to be refounded by Asan Donseki in 1651. There are two Japanese Zelkova trees on both sides of Sanmon entrance gate. The tree on the left side of the gate is “Zelkova Tree of Baigan-ji Temple” designated as Natural Monument of Tokyo. According to the topography “Shinpen Musashi Fudoki-ko” edited in Bunka and Bunsei era (1804-1830), the mention about this temple is found in the article of ‘Kumegawa Village’. Also, there is the mention about this Zelkova tree in the article; ‘There are two trees on the both side of the gate. One is an old Zelkova tree of 2 jyo in circumference. Another is Kajyu of 1 syaku 2jyo’. This tree has about 27 meters in height and about 7.3 meters in circumference. Its main trunk branches off into several thick limbs at a height of about 3 meters and the branches widely spread out. It grows thick and has a strong vitality. Furthermore, the tree mentioned as ‘another is Kajyu of 1 syaku 2 jyo’ in the topography indicates the Kaya tree on the right side of the gate. 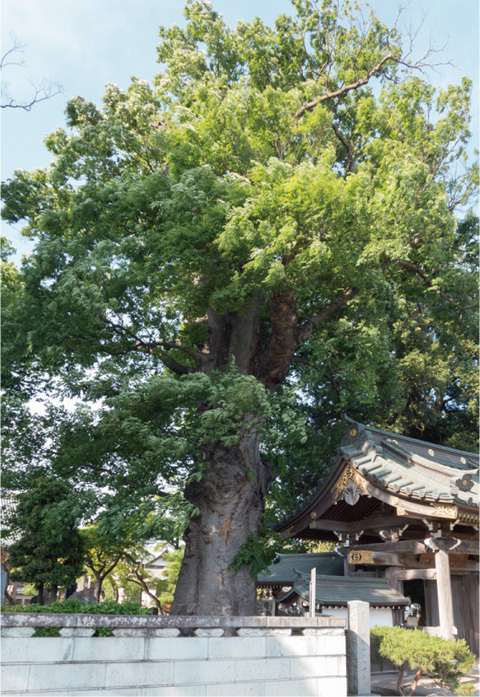 This tree is “Kaya Tree of Baigan-ji Temple” designated as Natural Monument of Higashimurayama City.
. keyaki 欅と伝説 Legends about the Zelkova tree . 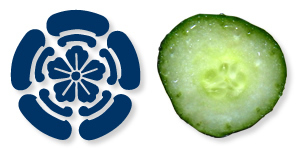 This was due to the fact that the family crest of the Gion Shrines, where Gozu Tenno is venerated, looked very similar to the form of a cut through a cucumber.
. the Deity Gozu Tennō 牛頭天王 and the Gion shrines .
. The Shrine crest of the Gion shrine .